Fanney Antondsdóttir and Dögg Guðmundsdóttir adopted the Icelandic tradition of drying whole fish to create this series of lamps, which were exhibited during DesignMarch 2017. 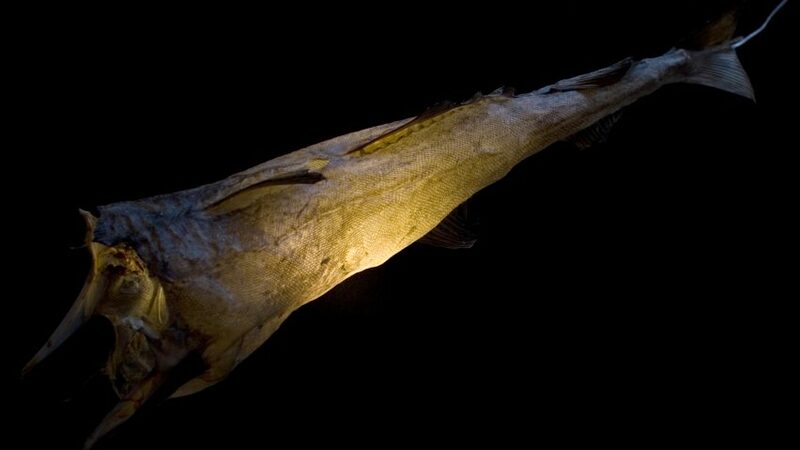 Using Iceland's traditional method of preserving fish, the duo behind Uggi Lights installed lamps inside the dried skins of large cod measuring over a metre in length. The fish are caught and skinned by hand before being reshaped in their original form. The skin is then hung up to dry in the open air. Originally established by the Vikings, the technique is still used in rural areas to prepare Harðfiskur, a popular Icelandic snack and export product. "We do all the dirty work ourselves," Antondsdóttir told Dezeen. "We skin the fish and turn them into illuminating objects." "We have been lucky to work with fish factories in Iceland that allow us to skin fish by hand. Nothing goes to waste and the fish itself continues its journey through the fish factory." The duo created the Uggi lights to reflect their heritage and cultural identity. "The inspiration comes from the old way of preserving fish," said Antondsdóttir. "We took a poetic approach and made the fish into an installation of lights." The pendant lamps were on show at the Harpa concert hall in Reykjavík during the DesignMarch 2017 event, but were first exhibited as an installation of 14 lamps in Copenhagen in 2001. There are currently a small number available to purchase. "We made the first ones in 2001 and they are still in good shape, so they last for many years," said Antonsdóttir. Guðmundsdóttir heads up Dögg Design, a brand that is based on Copenhagen but references Icelandic heritage in its work. Fanney Antonsdottir is an Icelandic artist based in Oslo. Italian designers Formafantasma previously used fish skin in a series of objects using various types of discarded leather. DesignMarch 2017 took place from 21 to 26 in Reykjavík, Iceland. Other highlights from the festival include minimal objects made from broken toys and an exhibition of nine designers from Baltic countries.